Hoho.. Todae is Tues.. Such a special dae.. Cos i'm working at Tampines.. Tml gg back to Seng Kang.. Haiz.. Boring.. Since last Thur to Sun.. I stayed in the East.. Pasir Ris.. Had a fruitful weekend.. Hahaz.. 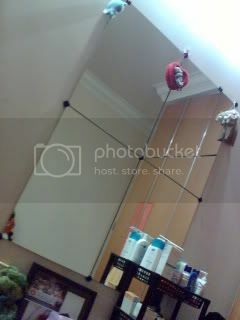 I can hold the dog with 1 hand.. Hehez..
Had sum Absolute Vodka with Ribena before wew went to bed.. Hahaz..
His sisters' rm had this super big mirror.. which i dreamt of having.. Hehez.. 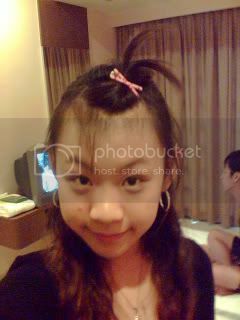 I gotten my off on Fridae, so i tot i could sleep late on Thurs and chill out with Anna n company to celebrate her b'dae.. But the timing reli nt gd.. Cos Many ppl couldn't make it.. I woke up and got prepared and was ready to go.. But it was cancelled last min.. So i went to Tampines mall as planned to buy Precious Moments Music Box for Dearie.. Haiz.. I aso wan 1! Acted like a straight hair ger.. Hehez.. I tot i hafta spent $60 so i could get the membership.. So I stupidly bought the ez-lonk card at $22..
Onli after I paid, i realise tt, i dun need to buy anything, juz pay a sum of $60, i could get the membership le.. Haiz.. 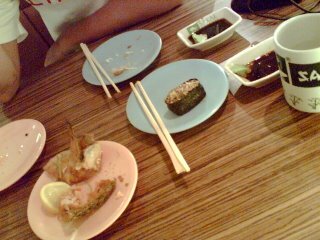 While waiting for the present to be wrapped, we went to eat Sakae.. So long never eat le.. Hahaz.. Meanwhile, was still considering wth shld get the membership anot.. Hehez..
Hahax.. After much consideration, i still unwillingly paid $60 for the membership.. Hehez.. Getting my card in a mth's time and my gift in May.. Wow.. Tts damn long lahz..
After tt, went to look for Sam & Sak at their chalet..
We played stupid card game like Heartattacks, Memory game & Bluff.. Wahahaz.. 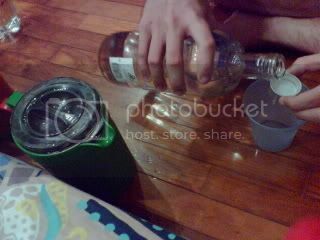 When Sak n Sam dunno doing wat, i was fighting with him.. Den i reli reli reli fell hard on the floor.. sob.. And he took the pic.. I was laming lahz.. Hahaz..D.U.M.B..
Mum called mi and said the office ger called her.. Sae i was missing and wth can help her (office ger) to look for mi.. Hehez.. Was supposed to inform mi of my schedule in HG on Sat n Sun.. But mum told her i went to camp, so the office ger sae gave mi 2 daes off, and they needed to train new staffs anyway.. Hehez.. That's how i gt my eatra daes.. ^_^ Happy Ger.. Hahaz.. Since Sam's parents was gg to meet them at the chalet, mi n him took our leave and headed "hm".. Ate dinner.. "instant noodles by his maid". Hahaz.. Almost every meal there is instant noodles.. But nice though.. Hehez..
Woke up in the afternoon, had lunch and headed off to Escape at 3pm.. His hse is damn near Downtown East.. Hehez.. His fren gt the dunno wat discount thingy sent to his hm, so we went in for onli $4 per person..
Had a fun ride on the Go Kart.. But we queued for like 2hrs b4 we gt to the ride.. Damn sian lahz.. But reli fun.. Hehez.. Next time sit his car betta.. 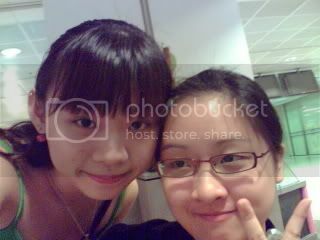 But he better pass in May.. (pray hard) Hahaz..
After tt, went to queue for the Haunted Hse.. 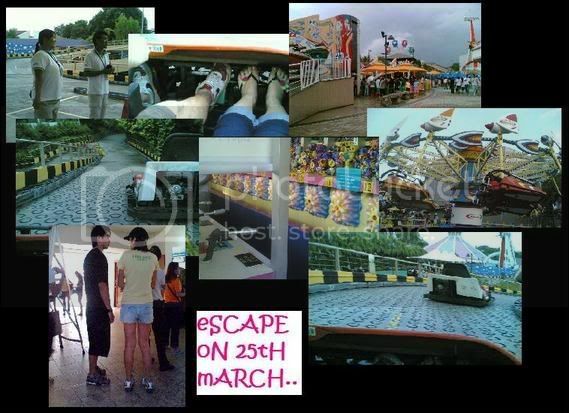 Damn stupid place.. Lucky the queue was fast.. Hahaz..
After tt, decided to head hm.. Gt a complimentary ticket for Escape which last for 3 mths.. Hehez.. Headed hm for dinner and went out to the airport at abt 9++ to pass dearie her pressie..
After tt, went back to Pasir Ris to meet his fren at a 24hr coffeshop.. 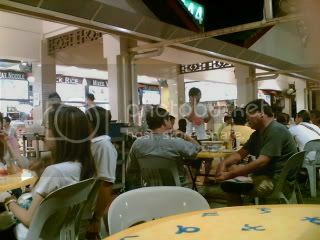 Though they toking crap n smoking there.. Their conversation is quite constructive and interesting.. Wahaha.. Went hm to eat n slp.. At abt 2++..
Woke up in the afternoon and "was supposed" to meet Dearie n her boy at Kallang Station at 3.. Was raining heavily, but we still got there at abt 3++pm.. 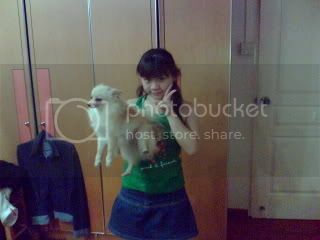 I called Dearie and tt stupid ger is still at Chinese Garden & I called her boy, he is at his void deck in Tampines.. WTH!! So angry.. 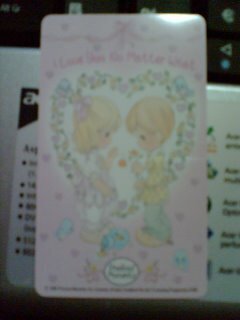 He saoi ask Anna to inform mi abt the lasteness cos of the rain le.. BUT SHE NEVER!!! 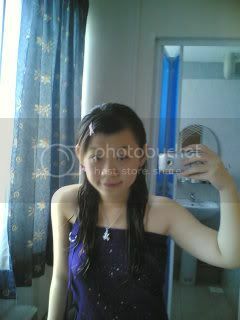 Sob.. Sua wo.. She juz wanna the world of their own!! ='( But she did apologised la.. hahaz.. 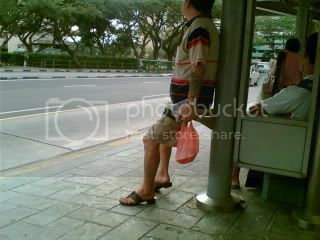 So mi n him waited for 1 hr at the bus stop..
And saw an uncle wearing.. Ermm.. "Heels"?? Hehez.. Sort of lahz.. Hahaz.. They arrived abt 1hr later.. 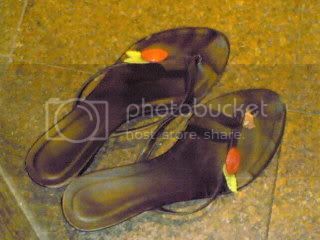 But i was so angry tt i walked too fast, and spoilt my shoe once again.. Hehez..
His fren gt one guai kia looking guy hu never smoke and no gf.. Quite cute and shuai looking, So i called Dearie and told her i saw her type.. Hahaz.. She gt so excited and want mi to "chop" for her.. Hehez.. (Gt aso i take 1st lahzx..) Hahaz..
After tt, went off to have Long John Silvers and headed to Tampines with his fren to play CS.. Hahaz.. Like Sec sch sia.. Hehez.. 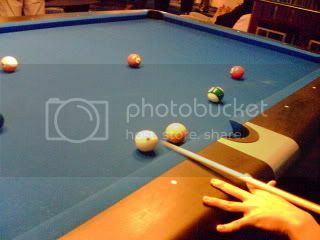 I was quite interested in the game at 1st cos i never seen ppl playing b4.. But i gt after 10 mins.. And i started to went into my lalalang and be lalalian.. Hehez.. I on my hp mp3, keep turning the turnable chair round n round, typing (or rather practising) my blog entry on the un-switchon com's keyboard.. Hahaz.. So bo liao.. And i chatted with a fren.. Hehez.. Went off at 12++am to Mac cos his fren was hungry... Mi n Him payed reli dumb game like " wu gui wu gui tiao", "hei bai chei".. Damn lame lahz.. After tt, walked a long long (abt an hr) journey to his fren hse to get bball and we played bball at another faraway bball court.. Hahaz.. I'm in a new painful heels sumore.. Hahaz.. Damn torturing lahz.. Sob.. But bball fun.. At least gt to had sum exercise after the huge amot of fd globbed in the past few daes.. Hehez.. Headed his hse in a cab at 4++am and slept at abt 6am.. I gt up at 8am!! And gt prepared to work in SK!! Hahaz.. And tt's how i spent my long weekend in Pasir Ris.. Hehez..
Tml at SK.. Borung dae again.. Hehez..